AUTOMUKO CONSOLE ORGANIZER: CUSTOMIZABLE INTERIOR FOR PERFECT ORGANIZING! Do you find the interior of your car messy and disorganized and locating the correct items a distraction while driving? Would you like a super high capacity console organizer with an interior that can be customized to your individual storage needs? If so, the AutoMuko Console Organizer is the perfect console organizer for you! 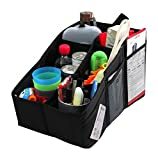 The Console Organizer is ideal for keeping items organized and within easy reach, such as file folders and magazines, calculators, cellphones and water bottles. The Console Organizer has a unique, adjustable divider design together with sloping sides, which allow the user to easily store and organize large and small items. The Organizer can be easily folded for convenient storage when not in use, and has 6 large pockets, which have interior storage for pens and pencils. – Dividable storage sections to store a range of large and small items. – Comes with 6 large pockets for keeping important items visible and within easy reach. – Can be used either in the front of the car to organize items or the back to organize children’s items. – Designed with 2 cup holder pockets for easy holding cans or cups while driving. – Convenient flat folding design for storage when not in use. If you’re looking for the perfect console organizer with a super large capacity, adjustable dividers and a range of convenient pockets, click “Add to Basket” now!